The Girl Scout cookie season is here! As most of you know, the sale started Friday, January 10th. 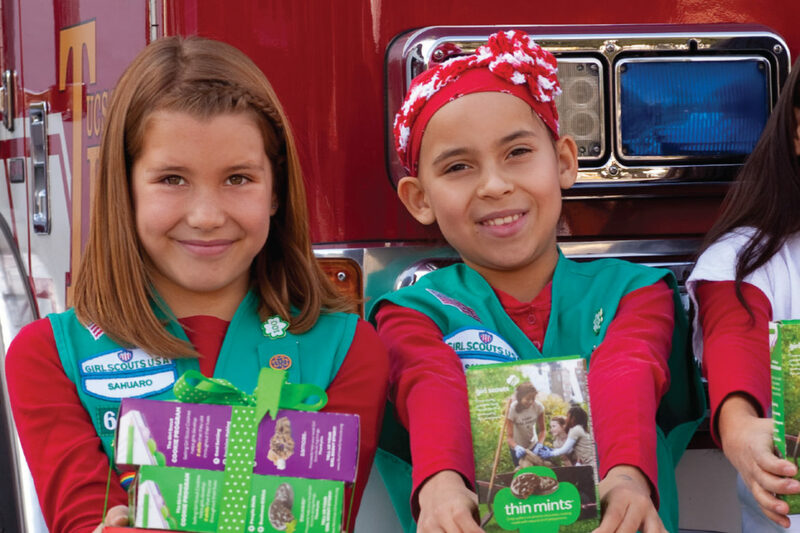 We have compiled an easy list of resources to help you support girls to gain the 5 skills associated with participating in the Girl Scout Cookie Program. Share this How To Be a Top Seller list with your girls from our blog a few weeks ago. Check out these selling tools on GSUSA’s website. We’ve created Earning and Learning sample meetings to help new troops get started and ready to sell cookies to support their troop activities. There is one for Girl Scout Daisy, Brownie, Junior and Cadette troops. These are also great for returning troops too! You can use them as a guide to connect the cookie program to other Girl Scout recognitions. GSUSA has tons of resources here including: safety activity checkpoints for product sales, activity booklets, videos and printable certificates. The Cookie Activity Pin is available to earn each year that a girl participates in the Girl Scout Cookie Program. The Coaching Your Budding Business Woman resources is a great practice tool for girls. You can even send it home with girls to practice at home. Check out the GIRLS section of the Little Brownie Baker website. There are great resources there designed just for girls! Cookie Wonderland is a great way to get girls excited about selling cookies! Set up a viewing party at your next troop meeting or as a special weekend event. Click here for more details. The Little Brownie Baker website also has great resources for families. Share this link with the parents in your troop to help them connect to their daughters success. Stay tuned for more great Girl Scout Cookie Program resources over the next several weeks!